A new bypass to the south of Reims forms a 14 km section of the A4 motorway and links Thillois and Taissy. It was constructed in order to help cope with the demand to carry an increasing volume of traffic. Some sections of the existing A4, which runs through the centre of the city, carry up to 26,500 vehicles per day. The project was undertaken by contractor SANEF (Société des Autoroutes du Nord et de I’Est de la France) at a cost of €245 m.
Although the construction process took 32 months to complete, the commissioning of the bypass on 23 November 2010 was six months ahead of the planned opening in May 2011. The early completion was achieved because of the efforts of all those involved on the site. The use of CCL post-tensioning systems - which meet the latest international design standards, including ETAG 013 and those set down by fib, AASHTO and UK CARES - provided the assurance of quality and conformity. Installation was undertaken by PCB of France on behalf of the civil contractor Demathieu et Bard. The stressing of the bridge decks was carried out using 228 no. CCL XM 60 Anchorages (19 strand 15.7mm tendons). In total 146,000 kg of 15.7 mm diameter prestressed strand was installed on the project. 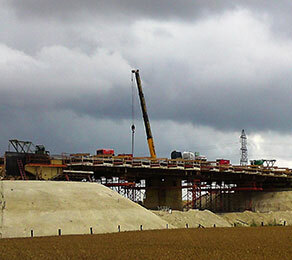 The total contract schedule ran from October 2008 to October 2010 and the project included 11 post-tensioned bridges.